For a long time, the state was seen as an exemplar for healthcare delivery. That's no longer true. Soumya Ramakrishnan said she was 20. But she looked younger. It had not been easy to find her house in Yerumuttinapalli hamlet in Krishnagiri’s Anchetty panchayat. This reporter found it only after asking several villagers for the house of the woman whose newborn died earlier this year. The baby’s death had predictable explanations. Krishnagiri is one of the poorer districts of Tamil Nadu. A large number of families, many of whom are Adivasi, depend on the subsidised food rations provided by the state’s public distribution system. Most of what Ramakrishnan’s family eats comes from the ration shop – 35 kilos of grain, a litre of cooking oil, a kilo of lentils. Her family supplements the meagre diet with ragi mudde (coarse cereal dumplings). It was a weak diet for the underage mother. She was underweight and anaemic when she conceived – she weighed 36 kilos at the time and her haemoglobin count stood at 9.5 as opposed to the normal range of 12.5. Her baby delivered at the primary health centre in Anchetty was underweight and sickly. It weighed 1.7 kilos – the norm is 2.5 kilos. The infant’s health deteriorated within the first 30 days. It was taken to the primary health centre, and then to the district hospital at Hosur. Four days after it was moved to the medical college in the neighbouring district of Dharmapuri, the newborn died. Ramakrishnan’s story encapsulates some of the paradoxes that have crept into Tamil Nadu’s healthcare delivery. Till ten years ago, the state was known for strong public healthcare systems. In 2007-’08, the Union Health Ministry’s District Level Health Surveys found that 51.8% of women who gave birth in the previous five years had received care from a health professional before their babies were born. To put that in perspective, only 18.8% of women across India had received such antenatal care. The state fared just as well on other parameters. But look at the latest DLHS numbers and you see something very different. On some fronts, the state’s public health system continues to work well. Today, nearly all babies in Tamil Nadu are delivered in clinics – from 87% in 2002-’04, institutional deliveries climbed to 98.9% in 2012-’13. But in many other areas, the state’s progress is plateauing. Improvement in infant and maternal mortality rates, for instance, has drastically slowed down in recent years. On a few parameters, however, the state is moving backwards. The number of pregnant women visited at home by health department staffers, for instance, has fallen between 2002 and 2014. So acute is the drift that Tamil Nadu has been overtaken by several other states. Why is the state’s healthcare delivery system delivering such starkly different outcomes? Scroll.in emailed a set of questions to Dr J Radhakrishnan, principal secretary to the state government for health. He did not respond. This article will be updated when he does. In the meantime, a good place to start understanding the state’s healthcare paradox is its infant and maternal mortality numbers. In the last 15 years, the survival chances of pregnant women and their babies have improved significantly in Tamil Nadu. The maternal mortality ratio has dropped from 145 deaths per 100,000 live births in 2001-’02 to 68 deaths in 2013-’14, according to state government data. As for the infant mortality ratio, it has fallen from 49 deaths per 100,000 live births in 2001 to 21 deaths in 2012. In both, the state does better than the national averages –178 for MMR and 42 for IMR – even though it is far from matching the numbers in developed countries. The MMR in the United States, for instance, is 18.5, which is almost one-tenth that of Tamil Nadu. Of late, however, as the chart above showed, the rate of improvement in the state has slowed. The numbers are plateauing, partly because the state’s approach for reducing IMR and MMR has hit the law of diminishing returns. See it like this. 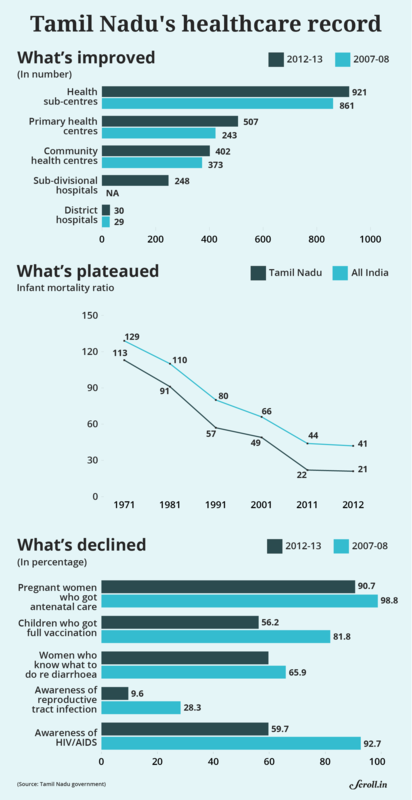 In Tamil Nadu – as in most of India – both IMR and MMR have dropped mainly due to a focus on institutional deliveries. In public health circles, this focus on childbirth in well-equipped primary health clinics is seen as a bureaucratic shortcut. Said Gaitonde: “States should work on overall development and see if the results show up as an improvement in IMR.” Instead, the state is using the improvements in IMR and MMR to project a rise in the socio-economic conditions of poor households, he explained. In Tamil Nadu, this gambit seems to have run its course. On one hand, there is limited scope for further improvements in IMR and MMR through institutional deliveries, which already account for 98.9% of all childbirths. For further improvements, the state needs to tackle more fundamental causes for infant and maternal deaths, like anaemia and malnourishment. Both impair the body’s ability to fight off diseases, among other things, and are staggeringly common. 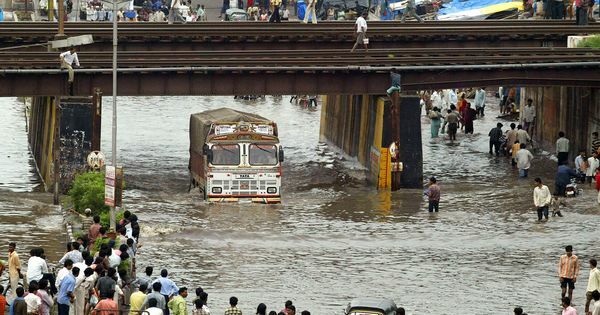 A pediatrician at the district hospital at Denkanikottai, a small town in Krishnagiri district, said: “For every 100 patients who come here, 40 are severely anaemic. Another 10-15 are moderately anaemic, and 10-15 are mildly anaemic.” Half of all the babies coming to his clinic, he added, were malnourished. According to the District Level Health Survey, as many as 60% of children aged between 6 months to 5 years in Tamil Nadu are anaemic. So are close to 50% women between 15-49 years. The best way to combat anaemia and malnourishment is to ensure people eat better. But that is easier said than done. Travel in the state and you will find that most diets are poor in nutrients. In Malhalli, a village in Krishnagiri’s Kotayoor panchayat, watery dal and rice was all that an Adivasi girl, who looked about 10 years old, sat eating for lunch. In the same village, a 17-year-old boy was shorter than his father who was about five feet tall. Cases of stunting and wasting were common in the village. An Adivasi girl in Krishnagiri's Mallahalli village eating watery dal and rice. Three factors – working singly and together – explain the nutritional deficits. These are poverty, caste and gender. In Malhalli, the Adivasis live in ramshackle houses built under the government housing scheme Indira Awaas Yojana. The ceilings of the houses are propped up with bamboo. Inside, there is little more than bedding and cooking utensils. One of the women here is Shivratnamma. Her husband works in Bangalore. He earns about Rs 8,000 a month, and comes home once every 3-4 months with about Rs 20,000, she said. The family’s income permits a diet similar to that of Soumya Ramakrishnan – rice, lentils and ragi mudde. No vegetables, milk or meat. In Tamil Nadu, said Gaitonde, “The Adivasi community is vulnerable due to their alienation from the forests, especially those living in the plains.” This is a countrywide phenomenon. Nutrient-intake by India’s poorest families is going down. This is why government programmes like the PDS and ICDS are essential. But, moving around the state, it quickly became apparent that they are not working well. But PDS provides only some of the nutrients people need. “Malnourishment and ill-health is not a problem the PDS can solve on its own. It only gives carbohydrates,” Jeyaranjan added. Caste and poverty work together to ensure PDS rations don’t reach everyone. In parts of Thagatti panchayat, Dalits have to pledge ration cards to borrow money from local moneylenders. Which means they have to buy food from the market. Said Bhairamma, a Dalit woman: “35 kilos of rice in the open market will cost Rs 500. Two kilos of sugar available in a ration shop for Rs 30 will cost Rs 80 outside.” Often, the market prices are not affordable for Dalits. Social discrimination often skews the amount of rations that communities get. Mangamma, in the Adivasi quarter of Mallahalli. Her teeth are stained yellow due to fluorosis. Travelling in Tamil Nadu, this skew showed up repeatedly. A report in The Hindu shows there is similar caste discrimination even in government-run anganwadis, which are supposed to provide at least one healthy meal daily to children below the age of six. In Tamil Nadu, as in most of India, women are far more undernourished than men. 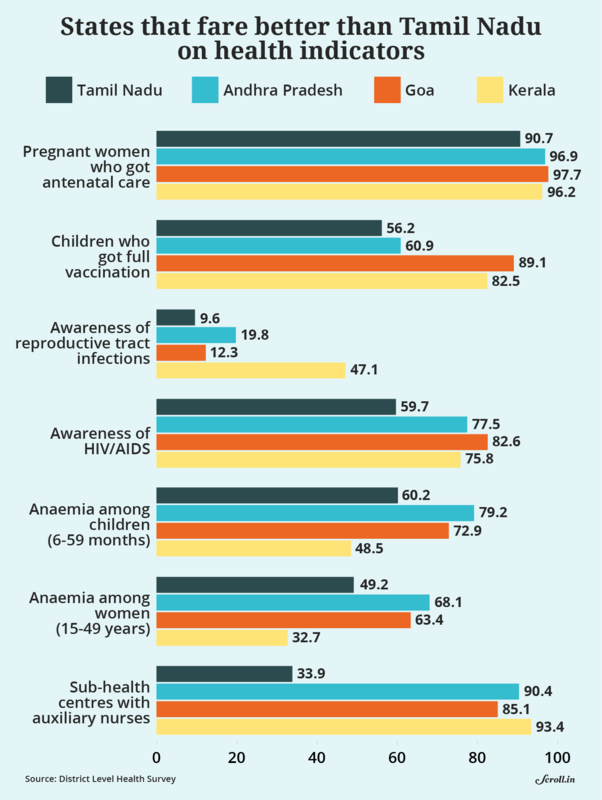 In 2015-’16, 55.1% of women between 15-49 years in Tamil Nadu were found anaemic in the National Family Health Survey, as compared to just 20% men. V Geetha, a social historian in Chennai, attributed the gap to the food-sharing arrangements within households that gave preference to men. Women also face the pressure of repeated pregnancies till they land a son. This shows up in visible ways. At a petrol pump at Denkanikottai, a young woman sitting on a motorycle with her husband and two children abruptly fainted and fell off the bike. The contrast between the spouses was remarkable. The woman, in her early twenties, was sunken-eyed and gaunt-cheeked. The man, on the other hand, was positively muscular. 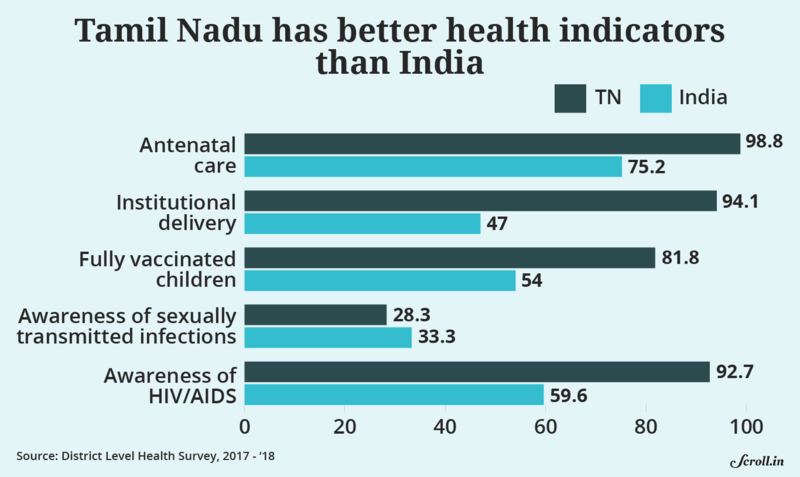 Put this all together and you see why Tamil Nadu’s health improvements are stagnating. The state has plucked the low-hanging fruits. But the deeper problems intricately bound to income, gender and caste are proving harder to solve. The Dravidian parties in the state may be publicly opposed to caste but in actual practice they field candidates from local dominant castes. Over the years, this has institutionalised a bias, with government services working better for intermediate castes than for weaker ones. Not just ration shops, even access to toilets is skewed. Along Coimbatore’s Variety Hall road, in a slum largely home to Dalits, count the number of public toilets for 700-odd residents. For men, just two are functional. Even as social schisms in the state remain intractable, the capacities of the state health department have come down. The second part of this story takes a closer look at this.